We are happy to announce an upcoming event that STC is organizing in cooperation with the 4CITIES Program in Urban Studies at University of Vienna and the Municipal Department of Urban Development and Planning of the City of Vienna. More information via the Facebook event or download the PDF-flyer. A growing emphasis on urban livability, changing mobility patterns, and the need to overcome urban environmental challenges have upended the paradigm of car-centric urban development. In turn, cities across the globe are changing the ways in which public urban space is used, planned for, and built. This ongoing transformation needs to accelerate if we are to reach the goal of carbon-neutrality by 2050 as agreed upon at the recent COP21 in Paris. In cities across the globe major portions of public space are reserved for parking privately owned cars. In Vienna, nearly 70% of street space is given to motor vehicles, despite the fact that privately owned cars remain inactive, on average, 95% of the time. The transition away from fossil fuels and private motor vehicles offers great potential for citizens to reclaim urban space and improve urban livability and health. In this context, citizens play an increasing role in shaping urban public space. Citizen participation has been recognized by international urban policy documents since the 1992 Rio summit, and this year the New Urban Agenda will be agreed upon during the Habitat III conference. Undoubtedly, the process itself and the policies integrated in this document will reflect the ability of civil society to collaborate with professional planners in transforming urban development. The proliferation of participatory planning processes, grassroots urban development projects, and tactical urbanism interventions substantiate the demand for and responsibility of citizen engagement in building post-carbon cities. But what tools and processes are available to the general public, city administrators, and urban planners? How can public spaces be quickly, inexpensively, and creatively transformed to test new ideas for tackling big issues? • how city administration in Vienna is creating urban policy and strategy in a participatory way for reshaping urban mobility and public space. Sara Maurer of STC presented research at an international conference - Transportation for Sustainability - organized by the Transportation Research Board in the U.S. capital in early May. 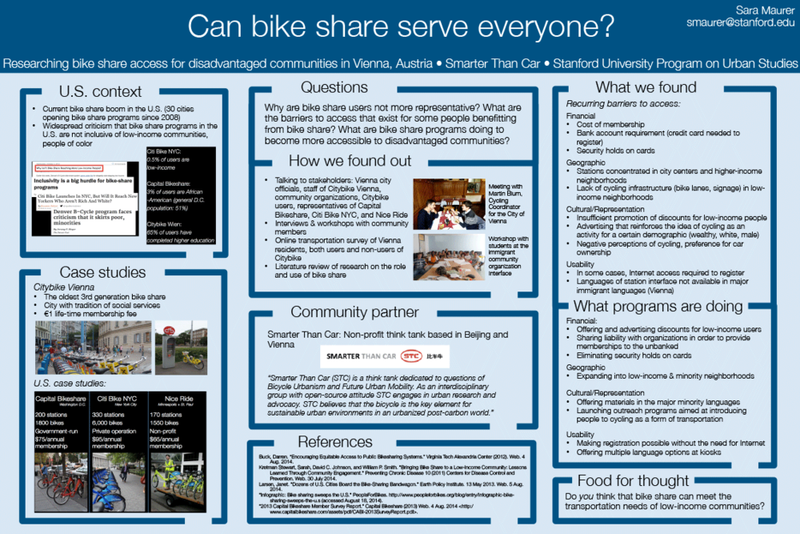 The research consisted of a recent STC project looking at the barriers to bike share access for low-income and other disadvantaged communities in Vienna and three cities in the U.S.
As the world continues to urbanise and the effects of climate change and resource depletion intensify, the automotive age is entering its twilight. In response, Smarter Than Car and Vienna Design Week are joining researchers and designers to lay out a paradigm shift for fossil-fuel-free urban mobility. Join [r+d] post-carbon Vienna and contribute to a public exhibition on the future of urban mobility at Vienna Design Week 2015. Smarter Than Car conducts a group bicycle ride exploring the theme "Safe City" with a psychogeographic approach.